You can save a lot of money by buying a property in the auction. The property sold in the auction is generally 20-30% cheaper than market cost. Recently I attended bank property auction along with my friend. It was indeed a very good experience. I was surprised that property was sold 40% lower the market rate. Many investors and property buyers get lured by the reduction in the property price and they blindly purchased the property in the auction without understanding pitfall. I am not saying that you should not purchase property in the auction. However, you should be cautious before purchasing property in the auction. If you are planning to purchase property in the auction this post is for you. In this post, I will explain property auction process and also discuss points to consider before buying property in the auction. 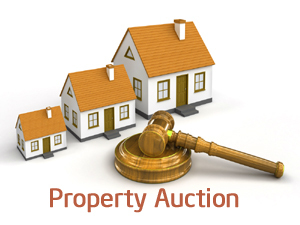 Property auction is the public sale of property, generally organized by the bank. A Property sold in the auction is repossessed property. When the people default on paying home loan EMI for the three times or above bank can auction the property to recover the home loan money. Property auction is a simple process where bank first set a minimum reserve price for the property. Every participant (bidder) needs to give EMD (Earnest Money Deposit). EMD is returned back if the property is not sold to you. A bid is accepted from every bidder. This bid will be either in seal envelope or spot open bidding. The property is sold to the highest bidder in the auction. If you win the bid you have to pay 25% of your bid amount to confirm the deal. Properties sold in the auction are disputed property. Bank sells the property on “as is” basis. No legal information about the property is available. Bank does not provide access to any property documents. So, there are chances that Title of the property is not clear and the property has been sold to property owner more than once. Bank does not take responsibility of any legal disputes arises once the property is sold via auction. You need to be ready to fight a legal battle in court on your own. Information available for the property is very limited and may not be based on fact. It is risky to purchase the property in the absence of factual information. I have come across instances where bidder realized afterward that heavy property tax was unpaid. A bidder had no choice but to clear the dues. You cannot ascertain that all pending dues of the property are paid by the property owner. A person who can default on EMI can default on other things also. In many cases, it is seen that utility bill, society dues or maintenance cost are not paid for several months. In property auction, you need to pay entire money in white only. As you are directly dealing with a bank you cannot expect the bank to accept black money. You need to consider this point before buying property in the auction. You cannot get a home loan on the auction property. The reason of not giving home loan is (1) Disputed property (2) Already mortgage and NPA for the bank. Original borrower or defaulter should become the confirming party in your sale agreement/deed. This is to ensure that in future he/she should not file a case in court to cancel the auction. The Minimum reserve price of the property is very important in the property auction. You should survey the market and satisfy yourself about the price of property. The minimum reserve price should be at least 20% lower the market price. Before participating in a bid you should actually visit the property to find out the repair cost associated with the property. Check for leakage and other maintenance costs. Look for other cost such as registration of property, stamp duty, society transfer fees, the cost of moving into property etc. You may need to involve advocate or sought for legal help for the disputed property. Where to look for property in the auction? You can find detail about property auction at following places. You are likely to get the property at a cheaper rate in the bank auction. However, there are multiple issues and pitfalls associated with the property auction. So you need to be cautious before buying property in the auction.